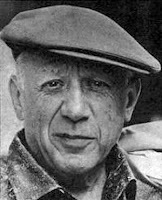 Pablo Picasso once said “I am always doing things I can’t do, that’s how I get to do them. ” I think that’s an accurate reflection of the way I operate…because for someone who feels firmly wedged into the humdrum 9-5 bump & grind money trap I sure do a lot of fun & exciting things. Wouldn’t it just be great though if my mind didn’t feel that way, I still did tonnes of fun & exciting things, just more frequently? The other day, when I was fretting about finances I decided that every time my head went into that space I would automatically stop that thought right there and say to myself: how can I bring more abundance into my life? And then wait for an answer. The first time I did it I happened to be fussing in my head while filling up my gas tank. After my mini-mind-intervention silence followed and then it dawned on me: buy a lotto ticket. It just so happens that I won $10 from that ticket. Is buying lotto tickets my ticket to the gravy train? I believe it is one of the infinite tickets to the life of my dreams. More importantly though, is noticing that when i stop worrying and start creating (or being open to ideas and taking action upon these ideas) that abundance (often in the form of money) flows into my life. Even small increments count, in my opinion. That works perfectly with my plan of doing all those things I can’t.